Generally if you want some vertex to be attached to some point on another Spline, you need to create a vertex at that point on the target Spline. That increases the complexity of your image and has a drawback - you cannot move the attached vertex along the Spline. 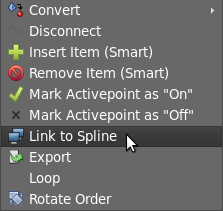 The Link to Spline feature provides an easy way to attach a vertex of a Spline to another Spline without the creation of an additional vertex. The vertex becomes "stuck" to the Spline and can be moved along it. Right click on the target Spline (not the Spline vertex!) and select "Link to Spline"
NOTE: At step 2 you can select Spline vertex, tangent and real ducks at the same time to link their values to the values on the same position of target Spline. It is possible to change linked handle position along Spline simply by dragging it. If you linked the tangent and width ducks too, you will notice what they are changing their values according the values of Spline. You may also specify the offset of the tangent and width ducks simply by dragging them. I.e. making tangent 90 degrees to Spline will keep that offset at any point of Spline. This page was last modified on 14 December 2015, at 10:35.